Hickling Windsurfing Club is situated at Hickling, on the Norfolk Broads. 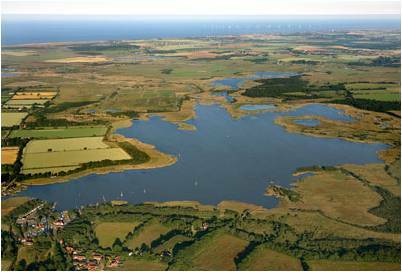 Hickling Broad is the largest expanse of open water in the Norfolk Broads (>600 ha.) and the most northerly. The situation of the broad, in open countryside and near to the North sea coast, makes it one of the best inland sailing venues. The Broad is shallow over almost its entire area, being only 1 to 1.7 metres deep throughout, thus making it an ideal venue for learning to windsurf, perfecting waterstarts, learning new tricks and grasping the fundamentals of the sport. Club membership includes access to the private car park, facilities, and beach. However, a broads licence is required to sail on the broad. The broad is owned/leased by the Norfolk Wildlife Trust, and licencing is managed by the Broads Authority. For a 360° water-level view from the middle of the Broad, click here.